GEORGETOWN, Guyana, Jun 14, CMC – The Cribbean Community (CARICOM) and the government of Cuba have both pledged to continue to strenthen relations in matters related to trade and the arts. 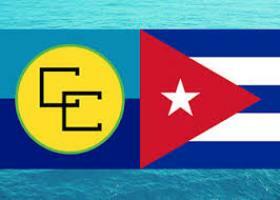 This was the outcome of talks between CARICOM’s Assistant Secretary General, Human and Social Development Dr. Douglas Slater, and Cuba’s Vice Minister Rogelio Sierra Diaz, when they met at the CARICOM Secretariat on Wednesday. The issues related to a Disabilities Project, the extension of Art programmes at the Edna Manley College of the Visual and Performing Arts in Jamaica, and trade. In the discussions on the Disabilities Project, Slater, who spoke on behalf of CARICOM Secretary General Irwin LaRocque, noted that a tri-lateral Memorandum of Understanding (MOU), among the Government of Guyana, the Government of Cuba and CARICOM had already been signed. He explained that there was a decision to implement the Project in phases and outlined that a Centre has been constructed by the Government of Guyana and a team from Cuba is already in Guyana working on the Project. In response, Diaz said firm steps had been taken and there was a lot to be thankful for. He said it was now important to acquire the equipment needed. In relation to the phase of the Project that would extend it to the other CARICOM Member States, he said that the CARICOM Secretary-General and staff would play a key role in achieving the goals of that phase. Turning to the matter of the extension of programmes in the School of Art at the Edna Manley School in Jamaica, the Cuban Ambassador said the Government of Jamaica had been contacted and the areas in which Cuba could provide assistance were identified. He explained that it was being proposed that there might be some additional infrastructural requirements for the project to move forward and various options to address this challenge were being explored. Slater expressed an interest in further engagement on the matter and also gave an assurance that the CARICOM Secretariat would engage with the Edna Manley School to explore the available options. Assistant Secretary-General, Trade and Economic Integration, Joseph Cox who was also present, spoke about a trade and economic partnership agreement that had been regionally applied in 12 Member States and highlighted that Haiti had now expressed an interest in joining the agreement. We have commenced our engagements with Haiti in this regard and we will have further engagements with Cuba regarding their inclusion and that should happen in the very near future”, Cox said. In relation to a Joint Commission in which the second protocol was signed in November 2017, he advised that Member States needed to accelerate their efforts to satisfy the legal requirements to be party to the Commission.